I want to know what sort of gem is the size of a pixie. Making Steven cry for his papa was like, the emotional low point of the season so far for me, even worse than when Blue picked Greg up. Don't hurt the kid any more. Could they not afford Jennifer Paz this episode? I hope Lapis gets some real screentime soon. Oh Steven, don't you know not to press giant, screen-filling X buttons? This is the least lore-heavy episode of the bomb, but fans have speculated that the requests that Connie, Peridot and Lapis protect Beach City in their absence might have unexpected consequences. 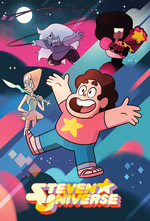 Like, might Peridot and Lapis prove overzealous, and Connie has to help protect the city from them? Or might Connie, maybe with Lion's help, try being a mysterious Batman-kind of figure? Maybe Connie might even enlist the help of her school friend? It's a fairly fertile field for fan fiction, is what I'm saying. I have a pretty good idea what Lapis, Peridot and Connie will be fighting against when they get back but it relates to the leak of the last episode in the Bomb so I'm keeping it to myself. This episode was mostly about Steven Deals with Trauma, but also we learned that we might get to pick up Doc, Army and Navy on the way back. What about Leggy and Eyeball though? The light speed bit made me really want to put on 3-d glasses. I'm sure I have some red-blue anaglyph glasses somewhere and I'm going to rematch this episode while wearing them. Someone has tried it; it doesn't add anything to the viewing experience.